A recent poster asked about machine covers. Due to different machine sizes it is difficult to recommend a specific pattern. It is easy to make your own pattern. Simply measure your machine. Add one inch for seam allowance so you have a little extra room. You can fit the pattern to muslin first and pin or baste together. Re-use the muslin pieces later as desired. Try the cover on the machine for fit. Hemming is done last. If your machine came with a plastic type cover you can use it for a pattern too. A few How-To in case you are interested and need more directions. PS: For my covers, I checked my manual for specifications. The measurements are already given. Easy! Enjoy! Last edited by Rhonda K; 05-18-2018 at 01:59 PM. I applaud anyone who can make a cover for the machine. I just throw a piece of fabric over my little brother. Hope he does not mind. I used ironed out brown paper grocery bags draped over my machines to make my own patterns. Didn't want to waste the muslin. No problem. 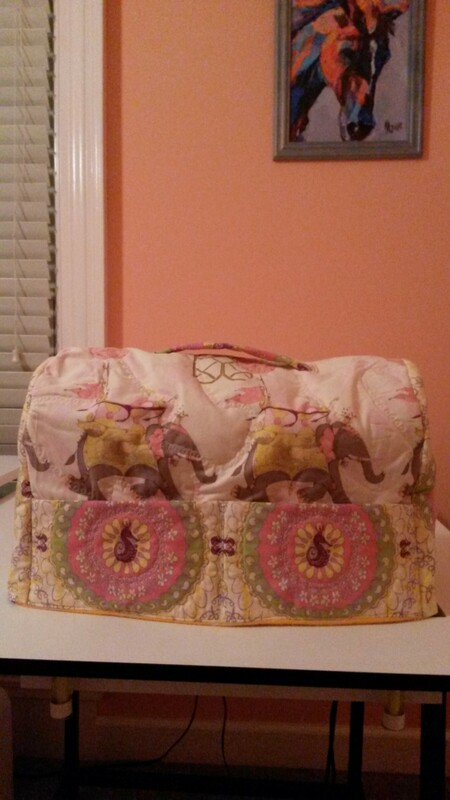 I had purchased a kit for a sewing machine cover from the local Sewing Guild that they offered as one of their fundraisers. They were made from upholstery fabric. I finally made it up and liked it so well, I took some upholstery fabric scraps I had and made one for all my machines. I still need to make one for my serger though. Boston, At least he is covered up. Funny I haven't seen a "he" machine before so you surprised me. I couldn't believe all the dust in my sewing room. How does that happen? AliKat, Great idea to use paper bags. Love it! Cashs mom, It seems hard to fit a serger cover. I made a fitted pattern for mine but haven't put it together yet. Another free pattern I found. 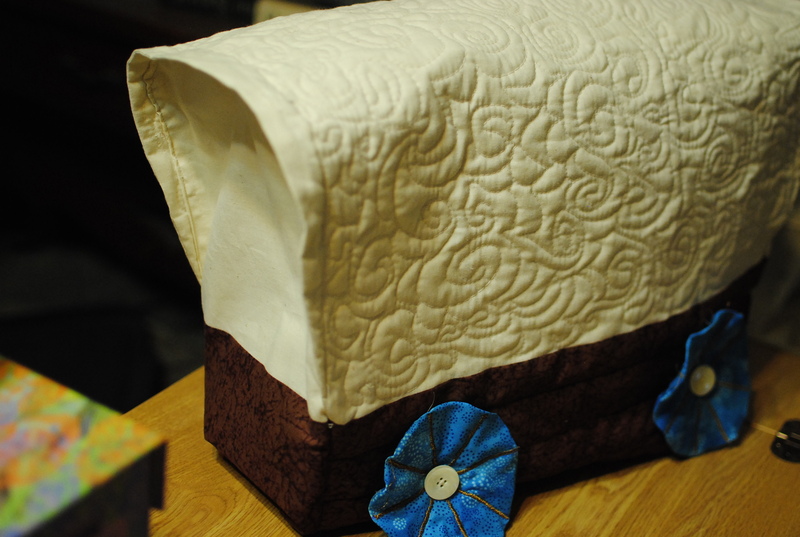 A friend asked me to make a 'covered wagon' looking machine cover for her. No pattern - just winged it. Had a few oopsies, and re-doing - but a mostly fun project. She wanted blue wheels - which ended up looking like morning glories, but she like it. She also added other pioneering 'equipment' that really decked it out cute. I've never had a cover for my machines until now - and that's only because it came with the machine! hahaha! Your covered wagon version is adorable! Such a fun cover I wouldn't want to take it off. I know what I thought I was making when I started this quilt, but it has changed several times since then. The little wagon is so cute! I love it. Last edited by Sarint; 05-23-2018 at 12:27 PM. Love it! Looks like the elephants are marching across your machine, Cute!